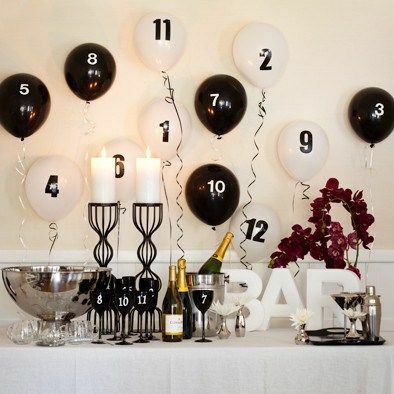 Enjoy 2018 New Year's Eve ideas with these fun, simple ways. New Year's Eve is a celebration, enjoyed in so many different ways. For some its the happiest time of the year full of hope, a celebration of conquering the struggles of this last year, saying goodbye to the old and welcoming in new fresh dreams, hopes and wisdom. For others, they can't wait until that last balloon has been burst and the New Year is in, no matter what it brings! You should celebrate! Whether you are alone, are having a small family affair or a last minute 'invite everyone you know bash'.. Celebrate! You are alive in this wonderful world and because you are still in it, that alone is worth opening champagne. This is a post about having a simple New Year, making it special without too much fuss. If you are going somewhere fancy schmancy, have a wonderful time! But if you are home, even home alone, this could make your New Year's Eve a whole lot better. First, let's talk about food. Most of the time, food is about presentation. A wonderful selection of some of your favorite cheeses, crackers, fruits, nuts, and dips is all your need unless you are providing a meal. This year its all about the board, and the longer the better. Its a simple way to have everything in one place, and an easy way to present food beautifully. You can use anything as long as it has that rustic plank farmhouse look about it. Here's a DIY version, in a blog post earlier this year, perfect for scraps of wood and leather. If you are having a stand up affair with more than 6 people, place a long board on either side of your dining table, separating them with a long runner and add flowers or greenery for color and interest. 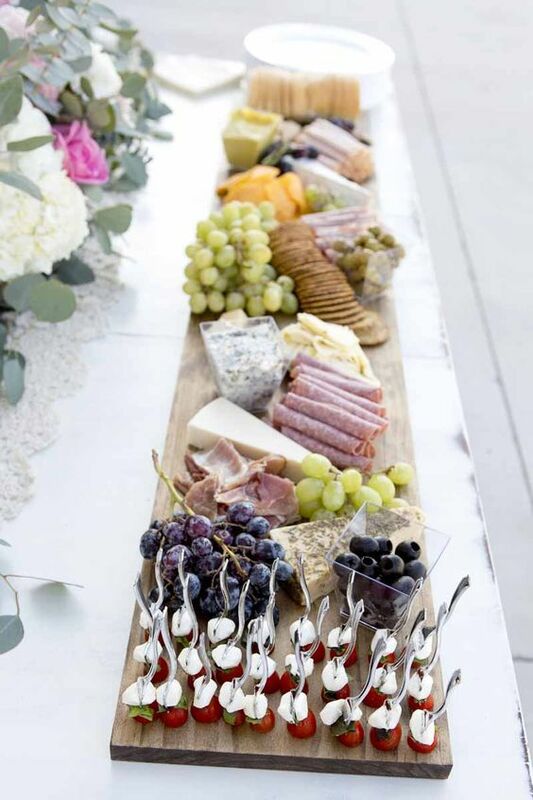 To create a long table length charcuterie board - here are some guidelines. STEP 1: Use a large piece of wood about 1 ft wide and as long as you like. Buy one from a home improvement store if you don't have one. If you want to make 2 boards, select a piece that is 2 ft long, and cut it in half. They might do this at the store, or do it at home if you have the tools. STEP 2: Sand the boards down really well, distress by hammering nails to create worm holes, hammer or use chains for a farmhouse look, then stain. Add linseed oil to seal. They are ready to use! A deconstructed salad is also very popular this year, with kale, arugula, figs and prosciutto, your salad awaits you! Four simple ingredients to create a board that looks divine. If you are having something formal, here are some table setting guidelines. 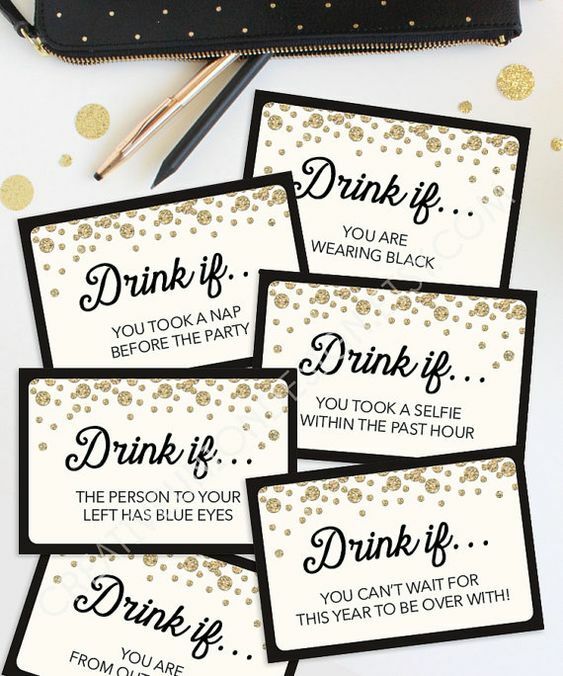 2018 New Year's Eve ideas include downloadable printable games like this drinking game are readily available and a lot of fun when it comes to breaking the ice. You can create your own sayings and signs and embellish. A printer, some scrap booking tools and you are set. 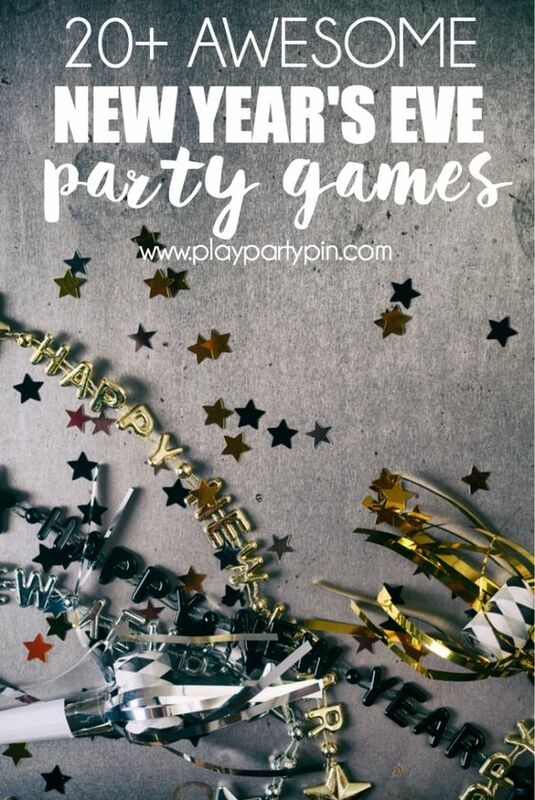 Here are more games for adults, kids, including Best Things I Did, Bingo, and more, all celebrating 2017, all free from Play Party Plan. Are your Christmas decorations still in place? They might be enough for your New Year's Eve soiree. But if you're looking for something simple here's a couple of suggestions that will add to the party atmosphere without taking over completely. 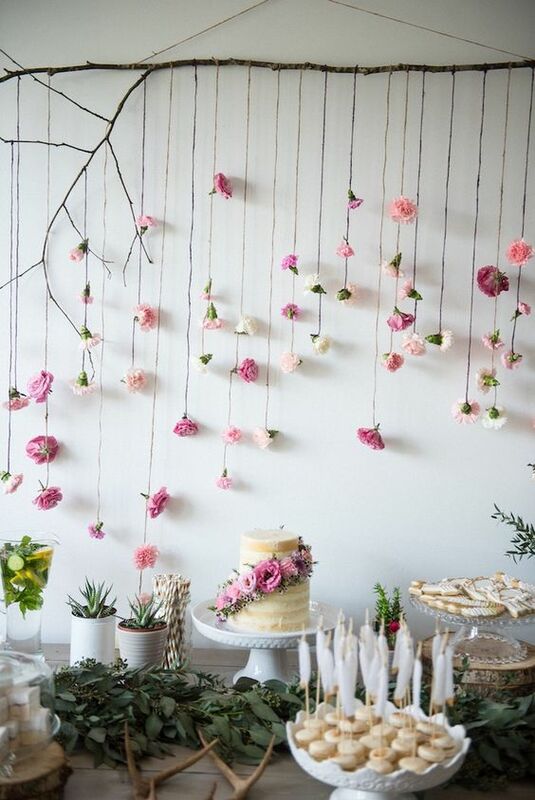 Flower bunting idea is great to get everything on the wall and out of the way. Add some lights if you want a party feel. 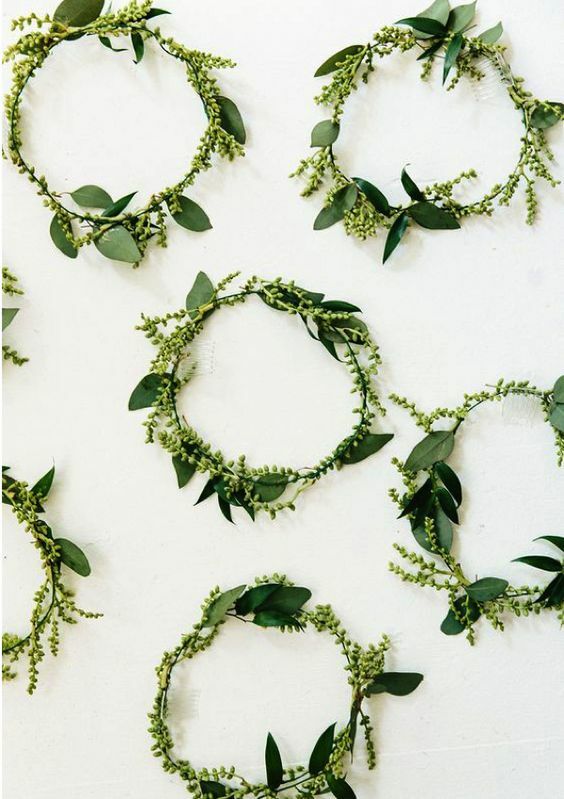 Or maybe all your need are some simple wreaths with a small New Year's sign, tied with a ribbon and used around food, candles, your front door, lamps or even guests! Oh My, What to Drink? You can make cocktails, serve champagne, wine or beer. I like to see what I have on hand and then scour Google for recipes. I have made cocktails I can't even pronounce, and some where everyone wanted the recipe. 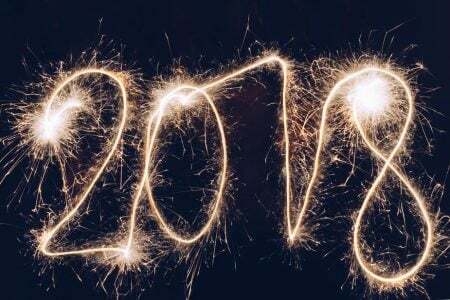 I must admit, I'm not a fan of plastic plates, glasses or forks, should your 2018 New Year's Eve ideas include the use of your best of everything? Either way make sure you have an area with drinks, lots of water, and something special for designated drivers and non-drinkers. No-one likes to feel left ou. If you are alone, you can still celebrate. 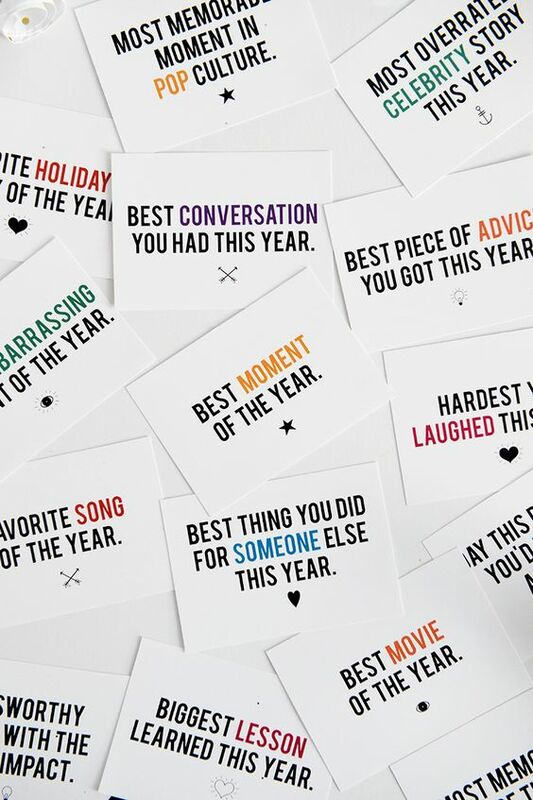 Take inspiration from some of these ideas above and write yourself a love note about your year. The biggest lesson you learned, the best movie of the year, the time you laughed the hardest, the loveliest thing someone did for you, the best meal you ate and what you would love next year that was missing this year. Looking forward to a wonderful 2018! 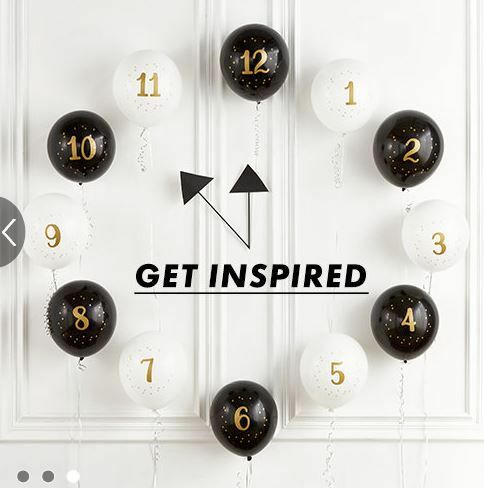 I hope you are too and I hope you enjoyed these 2018 New Year's Eve ideas!